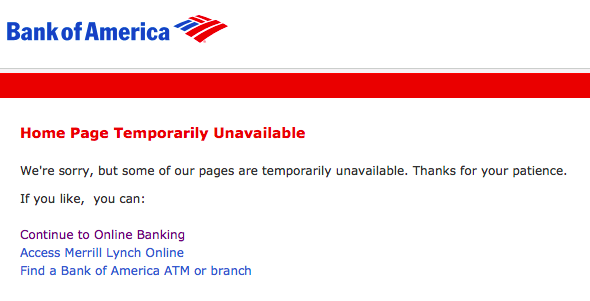 Bank of America’s home page and online banking have been down or operating very slowly for at least the past 24 hours. The disruption came a day after the bank said it would start charging a $5 monthly fee for debit card purchases. The news about the new fee was not taken lightly by the many Bank Of America’s customers who started to express their opinions about this coming fee in many social media sites such as Facebook and Twitter. A spokeswoman for the bank, Tara Burke, said earlier Friday that the site had been fully restored after experiencing difficulties between 9 a.m. and 11:30 a.m. Eastern. Burke was not immediately available to explain the later difficulties. The fact that Bank of America has not been able to fully restore its site means something either went really wrong or perhaps they could be experiencing some sort of cyber attack, this bank has been involved in a number of online controversies lately. Back in October 2009, WikiLeaks founder Julian Assange claimed he had a 5GB hard drive from one of the executive’s computers, leading Bank of America to refuse to process any WikiLeaks payments. Is this what is happening to Bank of America’s website at the moment? it is hard to say, but it is a probability. Operation BOA Constrictor comes as Harvard University’s Berkman Center for Internet & Society released a report Dec. 20 warning that DDoS attacks are becoming more prevalent while remaining difficult for most websites to combat. Bank of America, based in Charlotte, N.C., is the largest U.S. bank by deposits. It offers customers a free eBanking account if they do all their banking online and at ATMs. Customers are charged an $8.95 monthly fee for the account if they also use branch locations. UPDATE: October 1st, 2011 7:05PM CST, Bank of America’s website seems to be now up and running. The Bank has not commented about it yet. Agree. This is really bad either way… And as a customer, I hope they get this figured it out soon! You are certainly entitled to your opinion, but how at this point can you even tolerate them as your banking solution? I’m moving to TD Banknorth, I’m sick of the perverse business practices BofA places on the American public. Obscene bailouts, then hiking up charges against the very customers (tax payers) that bailed them out. Whatever is going on with BOA’s online banking system, they owe their customers an explanation other than yesterday’s Tara Burke statement that everything was restored as of 11:30am Friday. Well, it’s almost 3:00pm Saturday and, other than a very small window last night when I was able to get on, the site has been unavailable for more than 24 hours. Given what has to be a huge investment in both security and redundancy, this does suggest that there’s a major problem somewhere. Whether or not it’s related to the newly announced $5.00 monthly debit card charge is immaterial. BOA should either announce what the problem is or, if they don’t know, at least tell us that. Don’t tell a million customers that everything is working when it clearly is not. Site down all Saturday morning while trying to access from Northern California. Well they are back down again as of 10/3/11 at 10:50 am CST. Now October 3, Monday. Still down. Does that make it more likely it’s DDOS?